1. 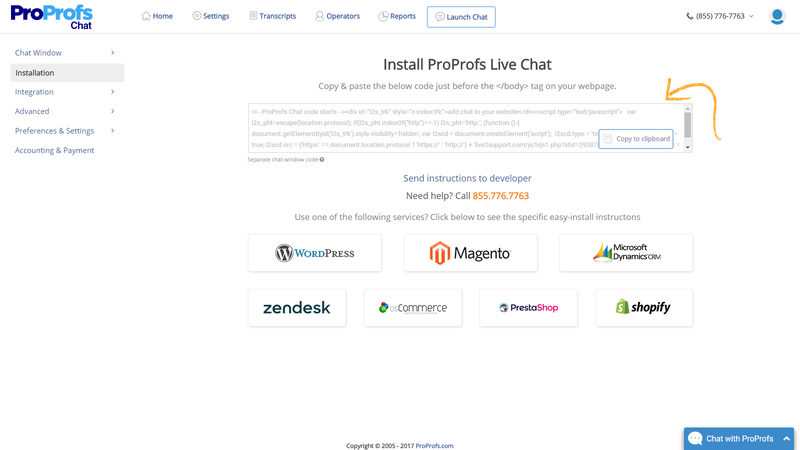 Add ProProfs Chat to Zendesk. 2. Send chat transcripts to Zendesk as tickets. 3. Get support emails from Zendesk admin panel. 4. Get Zendesk API token. Step1. Log in to ProProfs chat control panel with your valid credentials. Step2. Navigate to "Settings" and then click on the "Installation", Copy the chat installation code. Step3. Log in to Zendesk and navigate to your newly enabled Help Center and click on the "Customize Design" under "Settings". Step4. Click on the “Edit theme” link to bring up the code editor. Step5. Select the “footer” option under "Select template". This will allow for you to edit the direct code for the footer. Step6. Paste your ProProfs Chat installation code after </footer> tag. You can click on the "Preview" button to see the changes in a draft mode of your Help Center page. Click on the "Save" button to save the code. After you click the "Save" button, you will be taken back to the editor. Click on the "Publish changes" button to finalize the change and publish to all visitors of your new Help Center. Step7. Now ProProfs Chat will be available to visitors of your Zendesk help center. Send your chat transcripts and offline messages to Zendesk as a ticket. Step2. To get your chat transcripts as a Zendesk ticket, navigate to "CRM Integration" under "Integration" in "Settings". Enable the Zendesk toggle by clicking on it. Enter your Zendesk Subdomain (Example: https://subdomain.zendesk.com). Enter your Registration email address (Email address used to create Zendesk account). 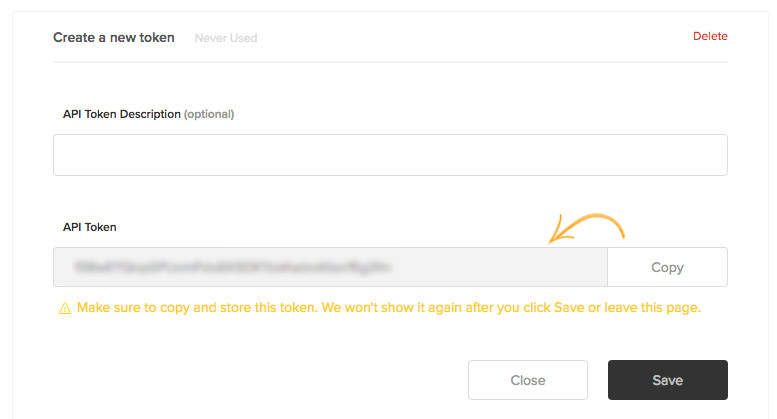 Enter your Zendesk API token. 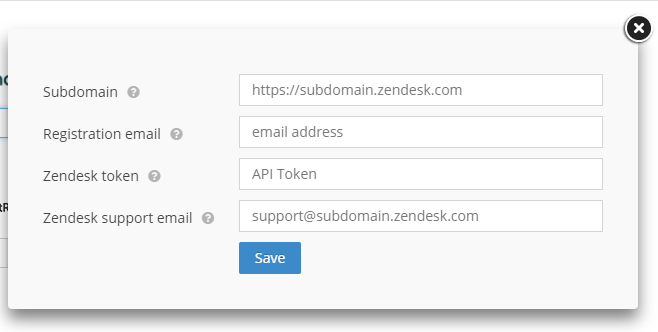 Enter your Zendesk support email address (Example: support@subdomain.zendesk.com). Click on Save button to save the credentials. Step4. After step 2 and step3 you will get your chat transcript and offline messages as a Zendesk ticket. How to get your Zendesk support email address from Zendesk admin panel. Step1. Click the Admin icon in the sidebar, then select Channels > Email. Step2. In the Support addresses section, click "Add address", then select "Create new Zendesk address". Step3. Enter an address you'd like to use for receiving support requests. Step4. Click "Create now". The email address is added to your list of support addresses. Step5. Click the Admin icon in the sidebar, then select Channels > Email. Copy your Support email address (Example: support@yoursubdomain.zendesk.com) from support addresses section, Enable "Accept wildcard emails" and "Rich content in email" option. Step1. Log in to your Zendesk account. From your dashboard, click on the settings icon.